Little is known about St. Hunna other than that she was an aristocratic lady from the royal family of Alsace and married to a nobleman, Huno of Hunnaweyer, a small village in the diocese of Strasbourg. She was known to be so caring of the poor around her that she even lent a hand in doing the washing for her neighbors in need. 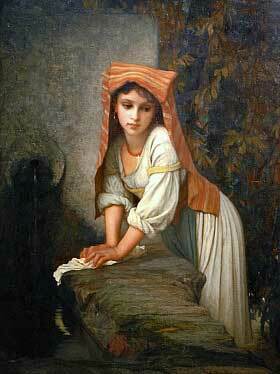 Because of this she was known as “the holy washerwoman”. She also donated properties to monasteries and financed the construction of churches. Hunna had a son who was baptized by the holy bishop of Nevers, St. Deodatus, and was given his name in Baptism. This son later entered a monastery founded by the same St. Deodatus at Ebersheim. Hunna was canonized in 1520 by Pope Leo X at the instance of Duke Ulric of Wurtemberg.